This report is part of a UN inter-agency flagship initiative to end child marriage in Latin America and the Caribbean (LAC). 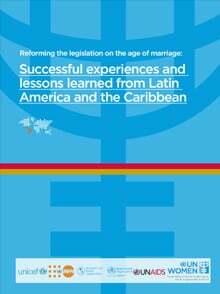 It provides an overview of the causes and consequences of child marriage in LAC and explores what worked in reforming laws relating to the minimum age for marriage in Ecuador, Mexico and Panama. The report offers useful guidelines for how to incorporate international human rights instruments to national laws and lead a successful reform process.